Our last two discussions was about deriving the areas of trapezoids and parallelograms. In this post, we relate the two areas. We derive the area of a trapezoid using the area of a parallelogram. In the following derivation, we use the trapezoid with bases and and altitude . 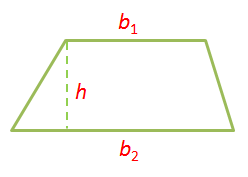 To form a parallelogram using a trapezoid, make a copy of a trapezoid and then rotate it 180 degrees and make the corresponding sides coincide as shown below.